So, I decided (rather last minute as usual) to take part in this NaNoWriMo charade once more. I’ve never “won” or completed the 50k minimum, but it is a most helpful way to push yourself to prioritize a project for a month even if you don’t complete that many words. This year I’ve decided to take my I Will Kill You for $5 project and compile the works I’ve done thus far, and hopefully 5 new ones, into a single volume for NaNo this year. I like data and visuals, so here is a visual breakdown of how things look on day two of November. As you can see, I started the month off with a significant of the volume already written. How much? Just under 20,000 words to be precise. After one day of writing, I’m now a little over 20k. But I will add that I do plan to extend some of the shorter stories. You’ll notice most of the stories are about the same length, around 2k words, those are ones I’ve finished and had deleted scenes and moments to meet a deadline. 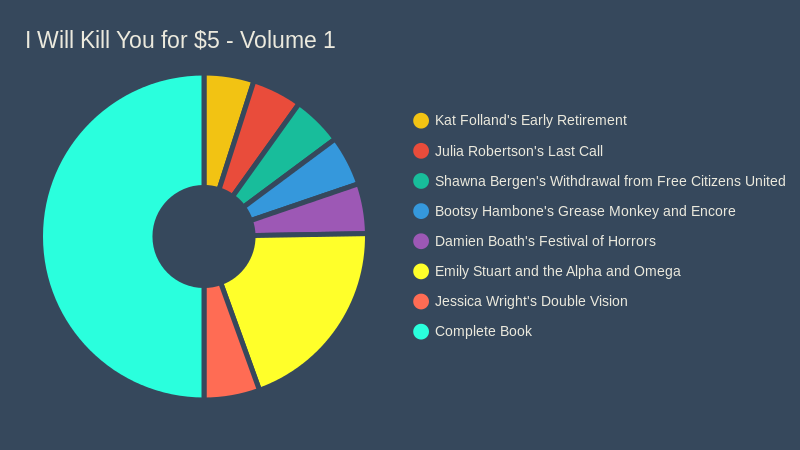 The red sliver at the bottom, Jessica Wright’s Double Vision, is actually the story I’m currently working on. And based on the outline I currently have, it has the potential to be as long (if not longer) than Emily Stuart and the Alpha and Omega. I need 5 more victims for my roster this November, and I will hopefully complete in time to feel good about myself (even if I did start a project I had already started for NaNo, which is technically cheating).